Tex-Mex started out as a nickname for the railroad that traveled between the America and Mexico (the train route was shortened on tickets). Now it serves as a nickname for American-Mexican hybrid dishes. More specifically with a Texas influence. And wow, combining these two cuisines yields amazing results. Sweet hickory barbecue sauce with cumin-tomato Spanish rice. Yellow cheddar cheese with pico de gallo. So here’s my take on Tex-Mex. A bowl filled with awesome. 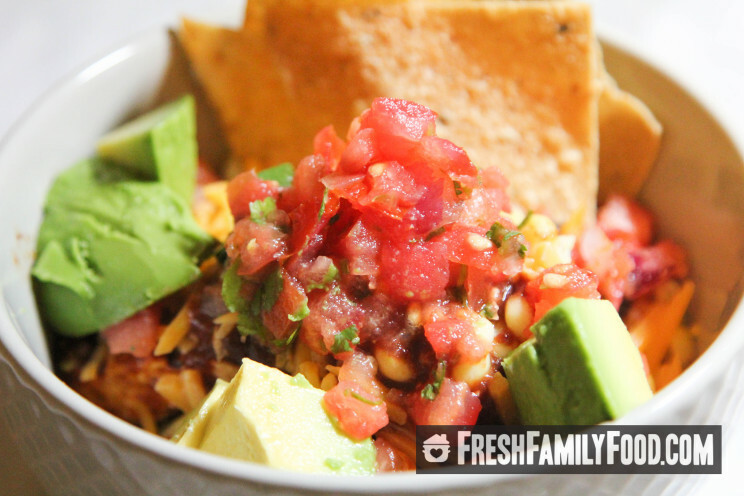 Spanish rice, black beans, barbecue sauce-grilled tofu, cheddar cheese, corn and pico de gallo. The first step is making Spanish rice. Sure you can make each part of this from scratch. But you can buy pretty tasty pico de gallo. The other ingredients all require very little work. The longest prep beyond the rice is simmering the black beans so they’ll get nice and soft in texture, but still with a little bite. 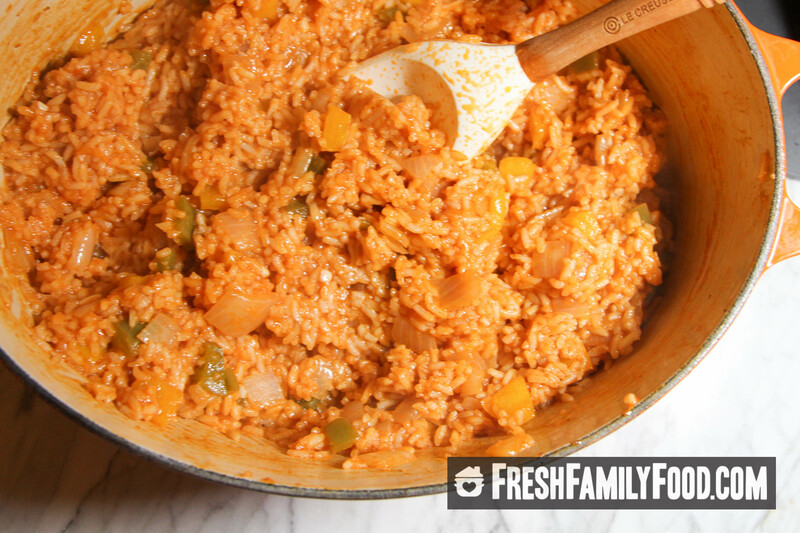 Most Spanish rice recipes depend on chicken stock. The main difference here is, obviously, using veggie stock instead. Don’t worry, it’ll still be scrumptious. And then make sure you load it up. I almost forgot to add avocado. Could you imagine? I swear everything but pancakes tastes better with avocado. Feel free to add salsa instead, I could see salsa verde being especially tasty. But keep in mind that with the barbecue sauce and the rice this dish doesn’t really need extra sauce. But feel free to sauce it up or just go with pico. Your choice really. Heat up the oil in a large saucepan, or better yet a French oven (at least 5 quarts in size). Once hot, fry up the rice until it is golden. Then add the diced onion and bell peppers. Once translucent, add the minced garlic, cumin and tomato sauce. Once combined, add the vegetable broth. Maybe reserve a 1/4 cup and only add later if it needs it. Cover and let simmer. Should take 30 minutes to cook up. Add more broth if rice is crunchy at all. Once the rice is cooked add the salt and pepper. 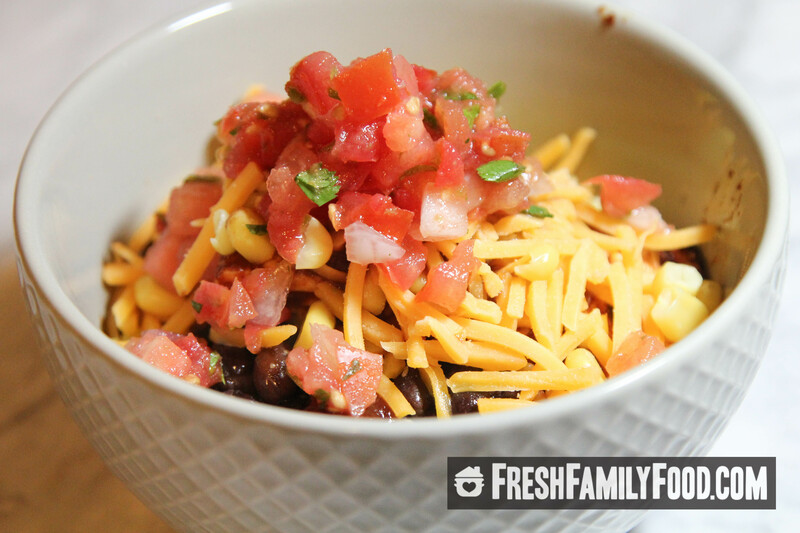 Add the black beans to a medium saucepan, without draining (you'll strain it later). Add a pinch each of salt, pepper and cumin. Press the tofu in paper towels or a kitchen towel to dry it out. Slice the tofu and drizzle most of the barbecue sauce over it and let it marinate for at least 10 minutes. Then grill it up (an indoor grill works great) -- it'll be done once its warm and you have sufficient grill marks. Warm up the corn (I love taking a Pyrex container, adding frozen corn and water and warming the whole thing up on 50 percent power in the microwave). Serve it up! Scoop in some rice, drain and add some black beans and corn, add the barbecue tofu, cheese, pico and avocado.